Creativity seems alive and kicking in magic, with a record amount of magicians choosing their best magic tricks to hit magic shops in 2013. Most new magic tricks become popular for a short time as magicians try them out, and see if they will make the grade for their acts. Usually the magic tricks end up in storage and forgotten. So, let’s take a look at the best magic tricks to be released in 2013. How the award winning magic tricks are selected. The Merchant of Magic is a magic shop. 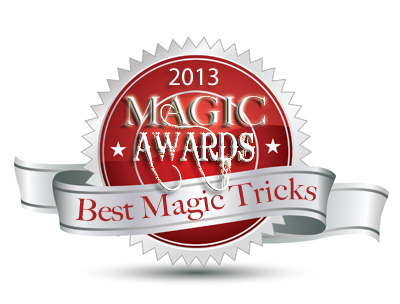 So, it’s only fair to point out that we also supply most of the items that have won best magic tricks awards. However, the best magic tricks are just a few out of over 21,000 magic tricks that the magic shop supplies. The magic shop receives no payment from manufacturers for selection of the list. We have specifically left out any items that are produced by The Merchant of Magic. The views of magic shop demonstrators. Reviews and feedback from magic forums. Real world testing by professional magicians. The Best Magic Tricks of 2013 Winners. The list is given in no order. Each of these magic tricks have won its place as the top most recommended magic tricks launched in 2013. 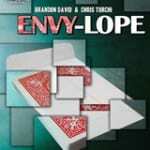 Envy-Lope has become on the the staple card magic tricks being performed by working magicians across the world. A signed playing card is lost in a deck of cards. Instantly the deck transforms into a little white envelope, containing the spectators signed playing card. A simple plot, visually stricking magic and an easy method has made this a winner with working magicians. A blank piece of paper, transforms into a £20 with just the wave of the hand. If a magician could do real magic, this is what they would do! 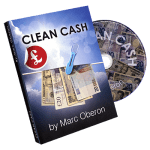 Marc Oberon has invented a unique method for this popular magic trick.It’s a winner because he has managed to remove any unnatural moves. The magicians hands are clearly seen to hold only the paper. For working magicians who don’t want to use the traditional gimmick/prop for a bill switch, this is a great addition to their magic trick sets. Peter Nardi took Rob Bromley idea for the Cigarette Through Card magic trick, and has greatly improved the method, making this practical and fun to perform for professional magicians. 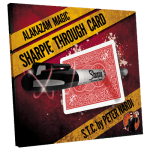 Sharpie through playing card allows you to easily stab a signed playing card with a normal Sharpie pen and then hand both items out completely unharmed! This magic trick is in the working magic cases of many performing magicians. One of the best book tests ever invented. 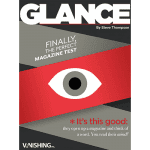 Glance allows you to perform one of the most impossible, memorable feats of mentalism with an object everyone has heard of and read before. 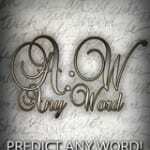 And with Steve Thompson’s clever new system, you don’t need to fish for any clues about the word before revealing it. Glance is amazing in both engineering and design. Take a quick flick through the magazine and you will be amazed by the craftsmanship of the wording and layout. Two joker playing cards are openly placed onto a spectator’s hands and two jokers are placed into the magcians hands. The magician just touchs his jokers to theirs, and all the playing cards transform into aces! 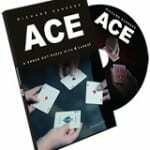 Ace by Richard Sanders uses a very simple sleight of hand technique with a clever gimmick, so it’s ideal for total beginners to magic. It’s a wonderful moment, when the playing cards transform. Electric Touch Plus allows you to use the force of electricity so you can deliver an electrostatic shock that will course through your body to your finger tip. Imagine reading someone’s mind and they FEEL the thought leave their mind as if it were zapped from their body. Electric Touch + was a major improvment on the original device that was a massive worldwide success with magicians. The range of uses and the reactions it gets from spectators has made this a winner with magicians around the world. Literally ANY word a spectator can think of can be predicted in a clean, impossible fashion and the best thing is that Any Word requires NO SKILL what so ever to perform. The spectator at the end of the routine really feels as though you had influenced them to think of the word that is predicted. Over the past three years Ben Willaims has honed this routine into a well oiled machine that devastates every spectator that witnesses it! He has performed this amazing piece of mentalism in casual settings, in loud working environments, one on one, in front of large crowds, he has even performed it on RADIO! In typical David Regal style, we have a practical and stunning addition to any table, or stage magicians act. A wonderfully crafted prop that is hard to find anything wrong with it! A folded playing card that has been on display in a CLEAR BOX, IN FULL VIEW the whole time is tipped out to show it is the spectator’s signed, selected playing card! 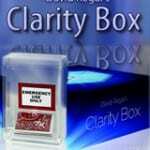 The Clarity Box is appearing in magicians working acts around the world and it’s performance ‘in the trenches’ shows just how useful this item is to working professionals. This funny little prop is the star of the magic trick! The tiny plunger holds onto to a thought of number of playing cards, locates a playing card selection, and a whole range of amazing plunger feats! 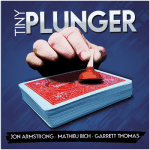 Originally invented Mathieu Bich, and expanded by Jon Armstrong and Garrett Thomas, Tiny Plunger is that rare prop that is both comical, amazing, and magical. Which magic tricks missed out? This list should be longer! There’s a few magic tricks missing from the list. They are the ones that YOU like best! Inferno by Joshua Jay /Card Shark. Card trick with out a pack of cards no pocket space perform anytime great audience interaction and fantastic magical impact. I think you missed out rope nut and knot by Giovanni livera, and the vdeck by peter nardi. What about The Saftey Net , Richie Smith And Mike Heesom. This has got to be a winner, as without this little piece of apparatus – surely you wouldn't perform the likes of smash and stab etc, risking permanent damage to your hand? Thanks for adding the Tiny Plunger to this list. Glad people are enjoying it! Perfect open prediction (POP) by Boris Wild: The best mentalism trick I've bought since the grail gold edition. You end clean and it's all done openly and freely and the spectator deals down the cards and the prediction matches their face down card every time. Boris Wild explains clearly and leaves nothing out on the dvd which is 47 minutes long. Brilliant stuff!!! Without a shadow of a doubt, the best effect that I have ever purchased from you is the “Invisible Radio”. No longer available, apparently. Mine is broken – no complaints – It did recieve some rough treatment. I just need to buy another one. Can you still source it?